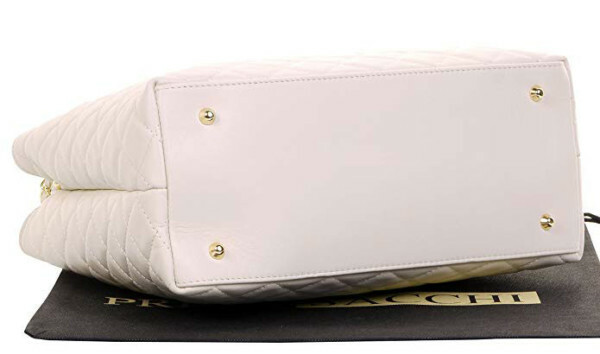 You can find the Primo Sacchi handbag online at Amazon. This gorgeous bag is hand-crafted in Florence Italy. The Italian quilted leather is stunning, plus soft and flexible. Two detachable handles conveniently clip off for your preference. A detachable fully adjustable strap with a drop range of 11-23″ is also provided to loop this bag over your shoulder or across your body. A fixed metal chain and interwoven leather strap are a nice stylish touch. The bottom is fit with 4 metal feet to protect the quality leather. It’s presented with a expensive designer look, yet practical for everyday use. This truly is a bag for all occasions, and lifestyles. Especially for chic, fashionable ladies. 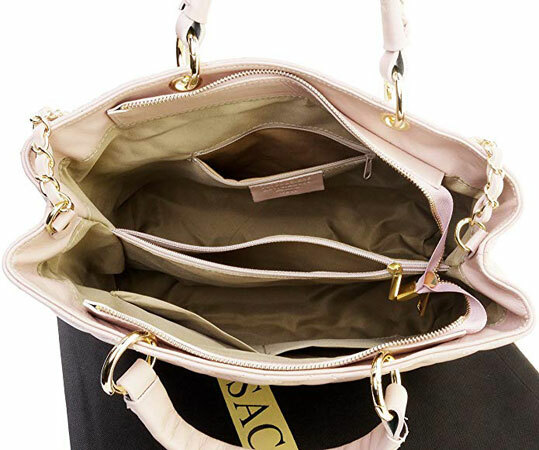 The Primo Sacchi Handbag comes in 5 colors; cream, black, navy blue, light grey, and pink. All the colors are softer and versatile, making them appropriate for everyday use. All 5 colors have gold hardware, including the woven handle, buckles and feet. Two main compartments are separated in the middle by a center zipped compartment. Further a small zipped compartment is placed in the rear lining of the bag. In addition their are two vanity pockets to the front in the front for small items like lip gloss/stick, a roller perfume, and writing utensils. Inside you can easy fit all your daily essentials, plus a tablet, notebooks, a smaller laptop and other items necessary for a business person. If you’re a commuter, or just like the option of additional footwear, this bag could totally accommodate a pair of pumps or flats. This is a fashionable piece, yet fully functional for your daily wear. Italian leather is know for the same thing, Italian wine is know for, it ages well! 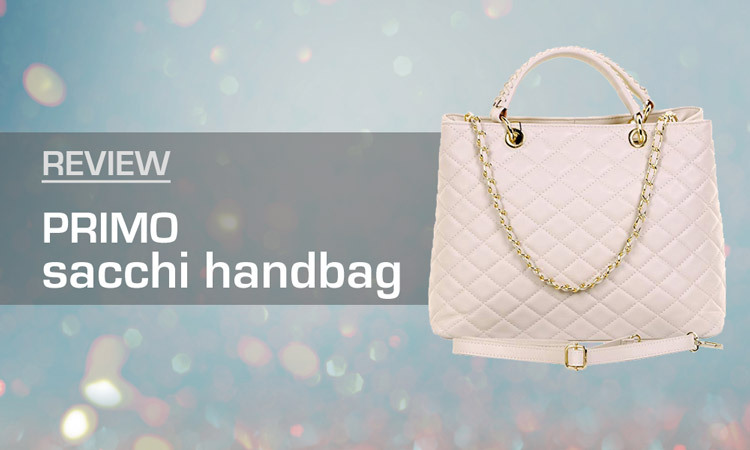 The Primo Sacchi handbag is well-made, typical of Italian craftsmanship. Soft and flexible, this is bag that when stored properly will hold it’s shape and keep it’s beautiful look. Included with this piece is special bag made to store your handbag. In researching this bag, no reviewers ever have anything negative to say about the quality and durability of the piece. As one reviewer put it “a Chanel look without the Chanel price tag”! And I agree. A typical Chanel handbag this size will run you about $5,000 new. No I didn’t add a zero, seriously, $5000. 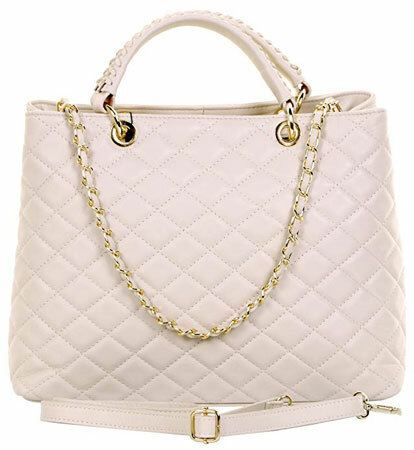 I actually found a bag on the Chanel website that is nearly identical to this Primo Sacchi piece. In contrast, the Primo Sacchi can usually be found for around $125 or so! You’re sure to get compliments and a little envy over this beauty! This gorgeous designer looking Primo Sacchi Handbag is hand-crafted in Florence Italy, but can be found on Amazon. It’s a stunning handbag, plus soft and flexible. The quality Italian quilted leather comes in 5 versatile colors. In researching this bag, no reviewers ever have anything negative to say about the quality and durability of the piece. If you can snag it for around $125 or less, I can say with certainty, this bag is worth the price. For ladies who appreciate the high-end designer looking bags, this would be a excellent gift, she will love. And you can rest easy knowing you don’t have to break the bank to purchase this piece.